We are at a bit of a crossroads in my house. My kids like their vegetables to stay plain. They'll eat only a few different veggies, and no sauces or dips or really anything else. They like them just simply steamed. Steamed broccoli, steamed asparagus, steamed peas. They don't want any cheese, cream, garlic, or anything else coming near them. On the other hand, I want food to be much more complex than that. I want each bite to offer me a few different layers of flavor. Broccoli is good, but it begs to be combined with cream and garlic and thyme. Asparagus is lovely, but asparagus with lemon or cheese is amazing. Carrots are fine. But carrots with ginger or baked into a pot pie or simmering in a thick stew are a whole new vegetable. I decided to attack this little "problem" of the warring taste preferences in my house by getting the kids over to my side little by little. I am going to treat their veggies with just the slightest, lightest, mildest sauces, and increase over time until my kids become full-fledged humans, who were born to be omnivores and actually like a variety of foods. I know there must be some sort of amazing metaphor for my job as a parent and raising my kids to be independent contributing members of society in there, but right now it's Monday morning and I am just getting into my first cup of coffee. I'll be ready to wax eloquent much later today. For now, I'll tell you about the broccoli that the kids ate, somewhat willingly, even with three actual ingredients in the dish. It is a nice, light, easy side dish. I made it in the morning and kept it refrigerated all day. I pulled it out of the fridge about an hour before we ate, so it could come back to room temperature. The flavors are mild, but sweet and salty enough to give it some interest. This one will probably grace our table a few more times during the current broccoli season. 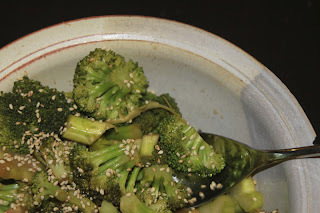 Steam the broccoli on the stove or in the microwave. In a large bowl, whisk together the sesame oil, soy sauce, vinegar and sugar until the sugar dissolves. Add the cooked broccoli and toss. Sprinkle sesame seeds on top just before serving.